Would it be possible to have a choice of type of IOBox? At some point vvvv went from an integer IOBox being created to bangs, toggles, etc. vvvvould be nice if the same menu as ‘Double right click’ to create IOBox appeared. indeed. vvvv tries to be clever here and creates an iobox of the subtype of the connected pin. in the case you demonstrated i’d argue thats its best choice. can you come up with a better case? 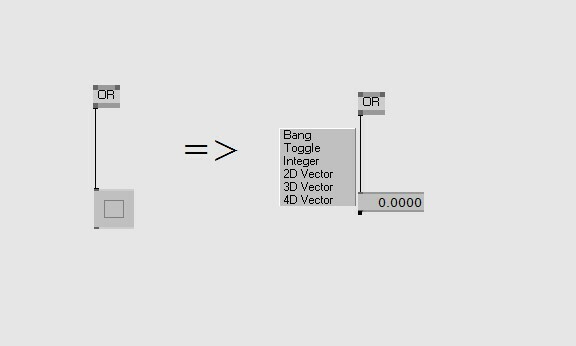 Personally, I save none numerical ioboxes for manual mouse input in to vvvv while developing. More often than not I’m hitting middle click to create an iobox, then wanting to hit middle click on it again to name it. My patch quickly starts to feel messy if I’ve got lots of different types of ioboxes. to hit middle cliick after you hit on middle-click on i/o to name it different! one case where i’d like to have a choice of the IOBox design is with the boolean nodes (OR, AND, …). i oftenly use them with bang inputs only (eg. coming from an automata) but the default IOBox created is a toggle. i usually change it to a bang in the inspector then but a quick menu would be more convenient here. hei gareth, sory for late reply. now this is similar to https://discourse.vvvv.org/ which seems more reasonable to me. this is not about “agreeing” but “reasoning”. i’d argue that popping up the menu in your example noone will ever choose anything. because a boolean operation can never return a vector or integer. can you confirm that or am i missing something?